Hou Yi is one of the playable Gods in SMITE. In a time long past, an unexpected calamity came to be. From whence none knew, ten suns rose above the horizon. Such incessant light and heat ravaged the earth, wilting fields of grain, drying rivers, even melting forged metal. Bent beneath the scorching rays, the people begged the Emperor-God Di Jun to aid them. In reply, he called the great archer, Hou Yi. 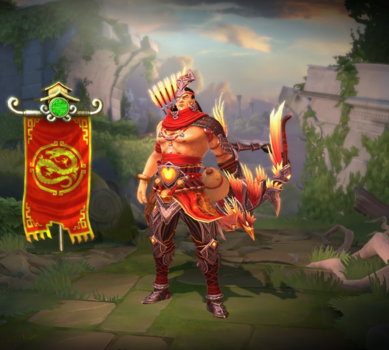 Armed with a mystical red bow and a quiver of white arrows, Hou Yi traveled to Earth. What he found was a barren land. Shielding his eyes, he peered to the sky where the ten suns cruelly flared. 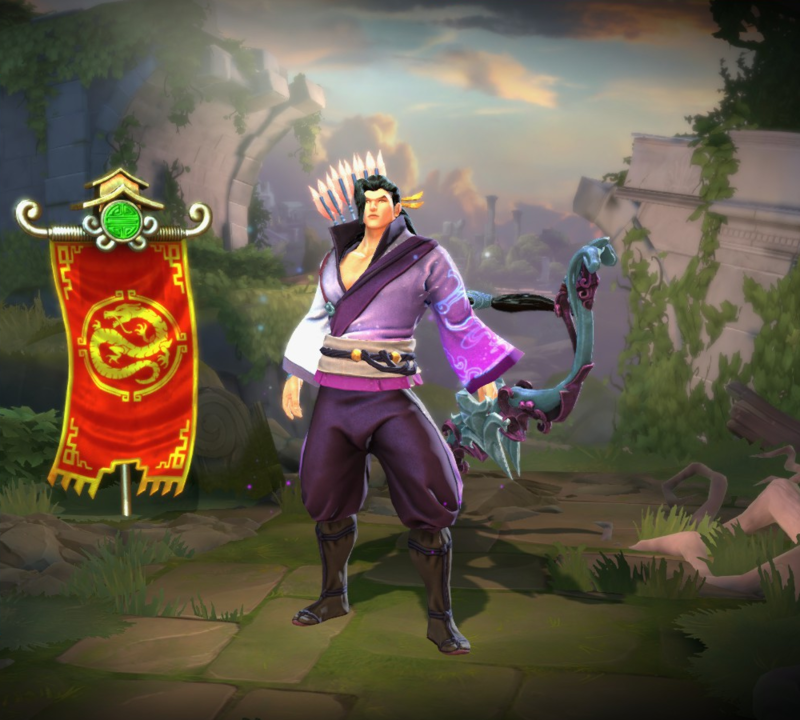 Nocking arrow to bow, Hou Yi loosed a warning at the suns hoping to frighten them away, but they impassively remained. So Hou Yi drew again and fired a killing shot. Pierced, the sun exploded in color and a giant red raven with three legs fell to the earth, slain by the white arrow. Eight times more Hou Yi drew arrow to cheek. Eight shots more he let fly. Eight more bursts rent the sky, and eight more ravens fell dead. But one sun he left, and so fearful of Hou Yi's archery, this sun behaved, dipping below the horizon. Now armed with the power of the red ravens he smote, sending light and fire against those that threaten the world, be it monster or beast, dragon or sun, man or God, Hou Yi is the Defender of the Earth. Doesn't affect Ne Zha's Wind Fire Wheels. Can deal up to 720/810/900/990/1080 (+225% of your physical power) damage. 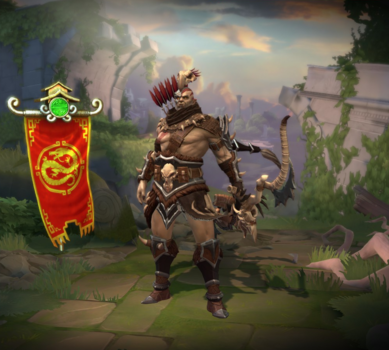 As Hou Yi utilize Mark of the Crow to knock-back, stun, and slow an enemy god in 5s. Chang'e is Hou Yi's wife. As imagery goes, Hou Yi would come to represent the sun, while Chang'e represents the moon. Hou Yi was the first god released in 2015. One of Hou Yi's jokes, "I've got 99 problems, but a sun isn't one! ", is a reference to the song 99 Problems by Jay Z. Both of Hou Yi's jokes about formerly liking peaches are a reference to one of his myths, where its said that he met his ultimate demise when Feng Meng - Hou Yi's protégé - and others beat him to death with a club made from the wood of a peach tree. One of Hou Yi's alt. stand animations is a reference to the "Praise the Sun" gesture from the video game Dark Souls. This skin was released in conjuction with Sun's Bride. 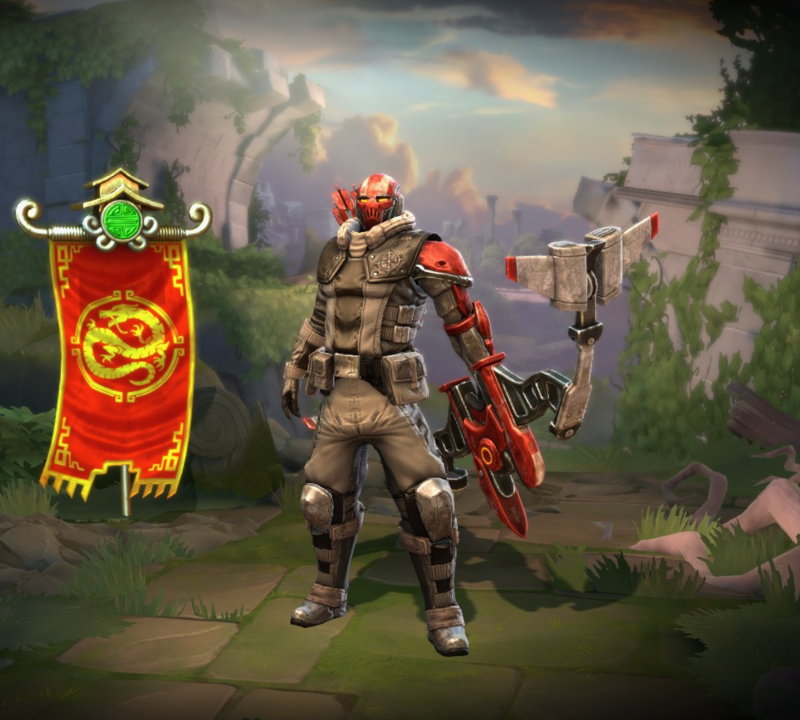 This skin shares its theme with Warchief Raijin. This skin was part of the event Escape from the Underworld. The actor who did the voice for this skin, Bruce DuBose, also voiced Thor. 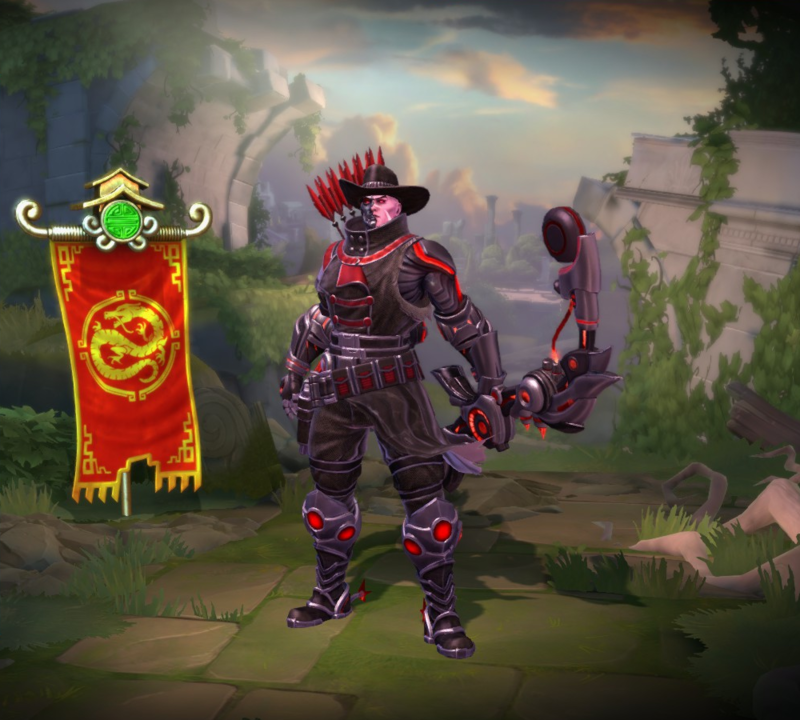 This skin shares its theme with Grim Weaver Arachne, Grim Horseman Guan Yu, Grim Wraith Hades and Grim Shadow Nox. This skin is based on an Angel. 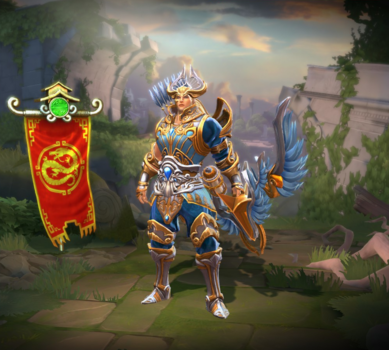 This skin share its theme with Midnight Dove Awilix, Archangel Chernobog and Celestial Guard Odin. This skin's name could be a reference to Sylvanus. 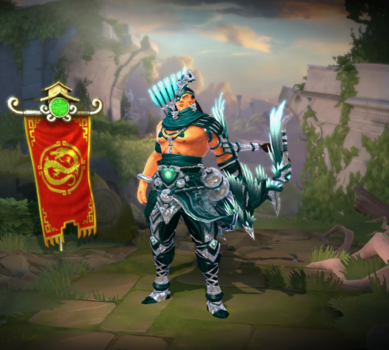 The actor who did the voice for this skins, Austin Tindle, also voiced Hou Yi. This skin was part of the Season Ticket 2018 Fantasy Points store. 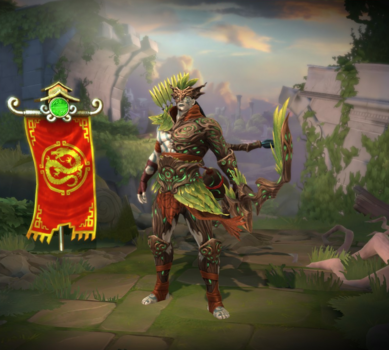 This skin could only be obtained by gaining at least 7000 fantasy points in the Season Ticket 2015. This skin could only be obtained by purchasing the Season 5 HRX Digital Loot Pack bundle before January 2019. Ricochet Bonus Damage now only applies to Gods. Increased Base Attack speed from .9 → .95. Increased Base Power from 38 → 40. Now Slows all targets inside it by 20% for .5s on every hit. Fixed an issue with the tooltip for this ability still displaying 30% Physical Power scaling instead of the intended 60%. Fixed an issue where this ability was still contributing 30% Physical Power vs targets marked by Mark of the Golden Crow. Reduced Cooldown from 14 → 10s. Fixed an issue with projectile accuracy from the sides. Increased Physical Damage Scaling from 30 → 60%. Fixed not highlighting all targets on 2nd and 3rd trajectories. Correctly updated the Iron Crow skin from Exclusive to Limited. 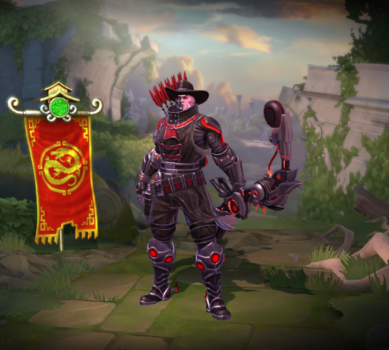 Fixed visual issue where Mark would not display on the target's client while using the Iron Crow skin. Fixed taunting Hou Yi stuck in air. Fixed description still showing old ability text. This ability has been reworked. When activated, Hou Yi will jump straight up into the air and pause, choosing a landing location. The build up on this ability has been removed. Fixed the tooltip incorrectly stating +15% instead of +25% penetration. Fixed Hou Yi getting debuffed when gliding over Janus Portal. Fixed a bug where, if Hou Yi was stunned during Divebomb, he could become immune to damage for the rest of the game. Fixed Hou Yi still getting caught in Artemis Trap when descending. Base Attack Speed increased from 0.85 to 0.9. Attack Speed per level increased from 1% to 1.2%. 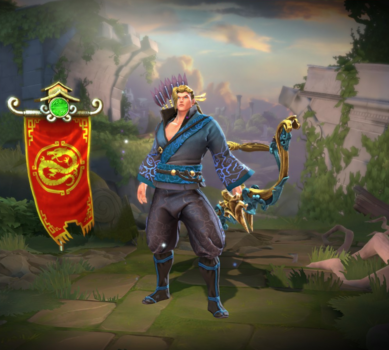 Hou Yi has been added to the game.